As an ex-pro who is fluent in both English and French, it is hardly surprising that Alain Rolland is considered a model match offical. Rolland, the son of a French father, was a scrum-half of some repute in his playing days. He made over 40 appearances for Leinster and also earned three caps for Ireland before retiring at the tail end of the professional era. 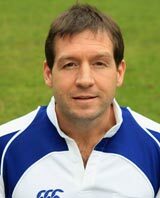 Rolland turned his attention to refereeing and his first international assignment was Wales' clash with Romanian in September, 2001. Less than six months later, he was officiating in the the Six Nations for the first time. His reputation as a firm but fair official grew significantly thereafter and Rolland was utilised in the 2003 Tri-Nations before making his World Cup debut in Australia later in the year. Four years later Rolland was bestowed with the honour of refereeing the World Cup final, the meeting of South Africa and England in Paris, thus confirming his status as one of the most respected and highly-rated match officials in world rugby.